This PDF 1.4 document has been generated by PScript5.dll Version 5.2.2 / GPL Ghostscript 8.15, and has been sent on pdf-archive.com on 04/07/2012 at 19:19, from IP address 27.97.x.x. The current document download page has been viewed 566 times. and academia, so as to evolve something that is useful for society. 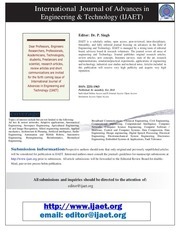 Research Paper for publication in IJAET. This file has been shared by a user of PDF Archive. Document ID: 00041494.